Because my hubby, brothers and even my eldest son are adidas fans, while I, as a performing artist on the side enjoy all forms of music, yes, including hiphop, I would like to share an event adidas Originals and Heavy Boogie are coming up with! After the wildly successful Breathe And Stop Tour in August 2012, the first region-wide tour of its caliber, November will see 3 more legendary Hip Hop DJs shaking down dance floors across 6 iconic cities in South East Asia. This dynamic event series continues on in the tradition of the ground breaking Breathe And Stop events by integrating dance, music & the audience in a celebration of originality and passion. 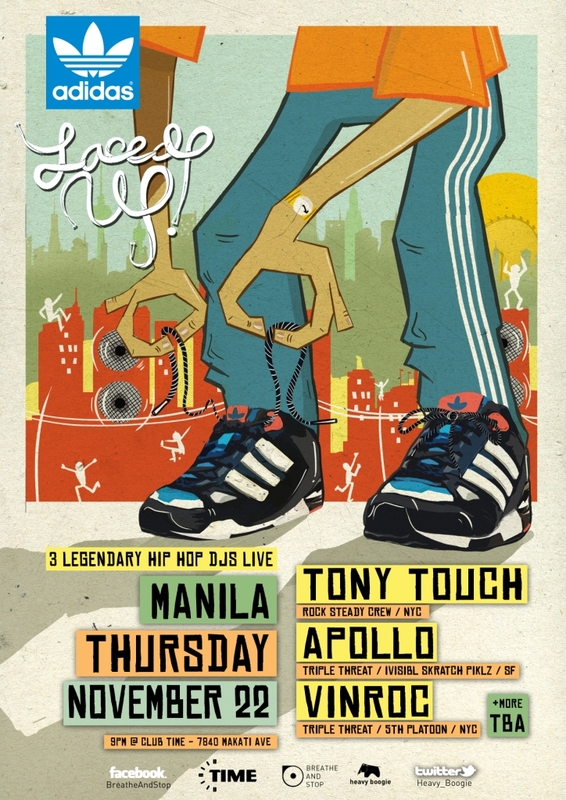 The "Laced Up" tour feature 3 of the world's most critically acclaimed party rocker DJs Apollo (Invisibl Skratch Piklz / Triple Threat DJs / SF), Vinroc (5th Platoon / Triple Threat DJs / SF) & Tony Touch (Rocksteady Crew / NYC) in Manila 22nd, Jakarta 23rd & Bangkok on the 24th. Armed & ready with a diverse selection of quality Hop Hop, Soul, Funk, House, Reggae & everything in between, these are three of the most skilled, well rounded, purveyors of quality music on the planet who have come together for the adidas Originals 'Laced Up' Tour. They are set to amaze audiences with blistering World Champion level technical skills & unparalleled musicality in their first tour of Asia together. The tour will also feature the Breathe & Stop Champion dance crew from each region in an exclusive showcase performance. Along with the Heavy Boogie crew, top local talent from around the region as well as breath taking live visuals fro, Scratch Media, this will be a non-stop party rocking extravaganza not to be missed. I suddenly miss dancing! I hope to enroll in a dance class in a nearby gym. Where do you perform? Vintage will always be here! 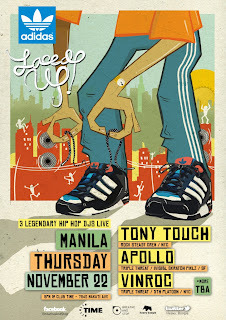 This is happening tonight at Makati only! Whoa, tonight already?! It's a school night. No can do for my kiddos. LOL Thanks anyway! That's cool! You must have a lovely voice!